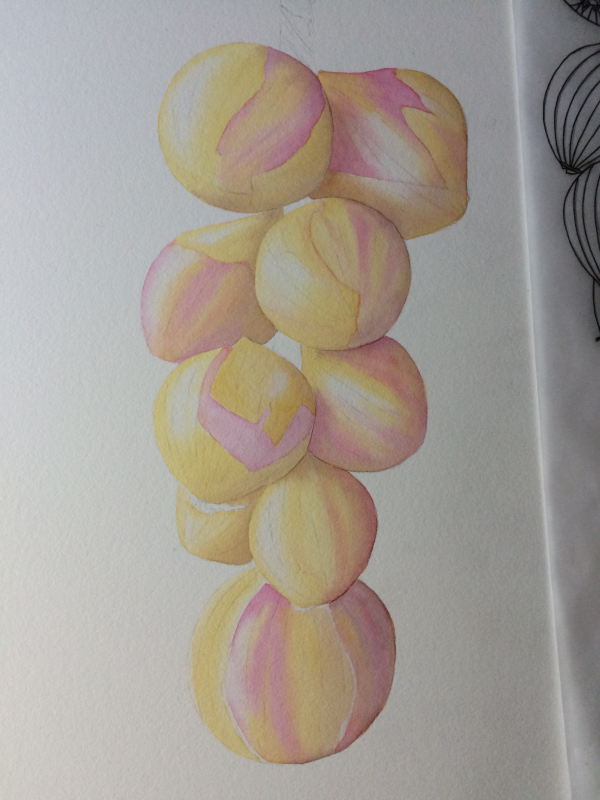 Assignment 7 for the Society of Botanical Artists Distance Learning Diploma involved painting a vegetable of our choice. I went to a number of different farm shops and farmer’s markets trying to find the perfect subject. I wanted to paint something a bit obscure and interesting… In the end, I settled for something really simple. Onions. This may sound boring, but when I looked at the colours in the skin – yellows, oranges, pinks, browns – it suddenly became a really nice subject to paint. The dull sheen in comparison with the crinkled dried skin, was really interesting. It helped that they were strung really beautifully, like they were hanging in a French market! As is my normal working method, I started with a line drawing of the onions on cartridge paper, and then used my ink pens to trace the drawing onto tracing paper. I then trace onto the back of the tracing paper using pencil, and then I can transfer my image onto my watercolour paper without ever drawing on the surface of the paper. 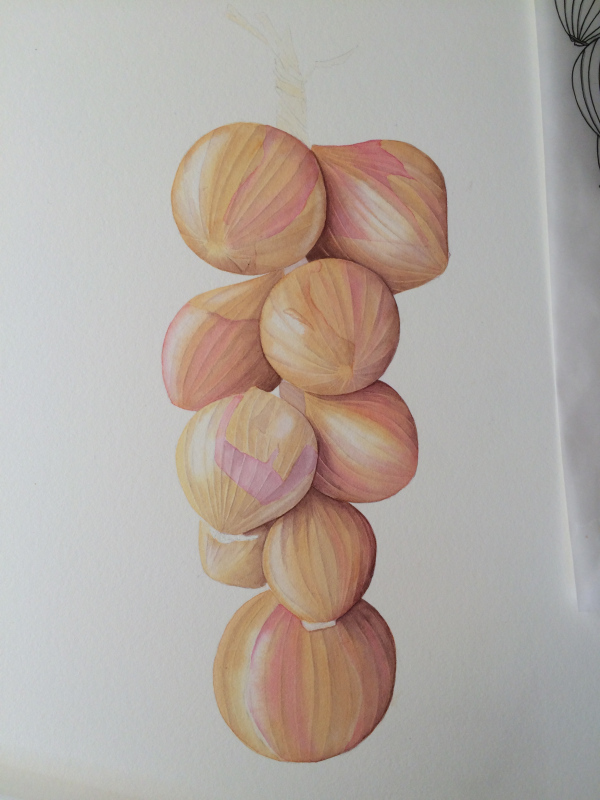 The tracing drawing of the string of onions. The tracing focuses on only the main form of the subject. My pencil drawing contains all the detail needed for the final painting. My initial washes demonstrate the form of the subject. 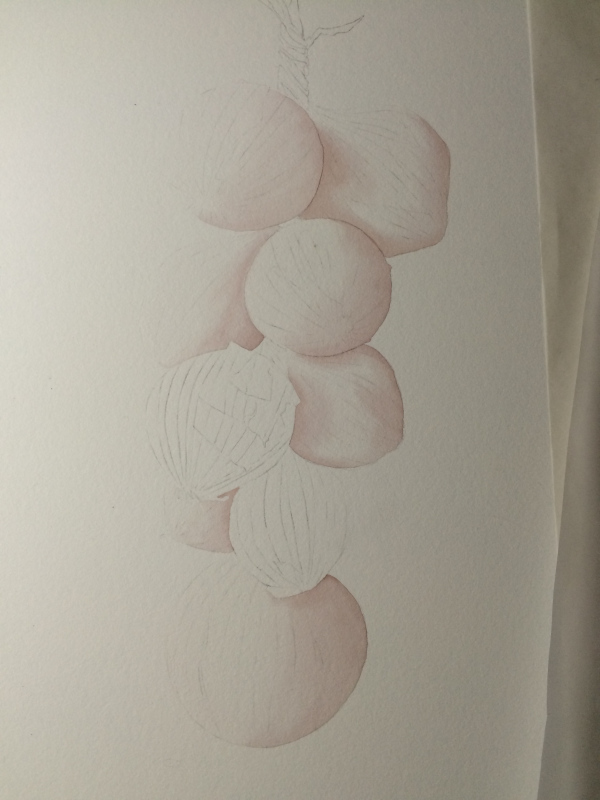 I mix a botanical grey, which I apply to the areas on the onions in shadow. This is using the wet-in-wet technique. I could see in the onions that some areas were predominately of pink hue, and other areas were almost golden. To ensure that I could get those colours to really glow after many layers of washes on top, I laid down bright washes (still wet-in-wet) of pinks and golds on top of the tonal underpainting. It’s a lot of fun to play with colour like this, but you do have to be brave!! I made sure that I left large, strong (i.e. white) highlights – this was achieved mainly by simply not putting paint on those areas, but also by lifting paint off the page. The highlights are crucial to getting the glow on the skin of the onions. Next, I do exactly the same as before. This time I was a little braver with the amount of pigment I used (you have to be bold, but at the same time, you can always add more)! You can see the effect of leaving the highlights on the lustre of the skin. The next part of painting involved two things – bringing the whole painting together wish washes of a golden brown. and also deepening the tones in the areas of the onions with strong shadows. These are still wet-in-wet washes. Next I began to add in some of the detail. The lines running along the surface of the onion are really useful to help to show the spherical form. I started by lifting the paint slightly along these lines, demonstrating the fact that they are slightly raised and catching the light. I then added shadow on the right-hand side of each line, using the same botanical grey from the first wash. Immediately after doing this, the onions jumped to life and started to look like onions! Throughout the next few stages, I was constantly checking tonal values, and adding more strength, and lifting up paint, where necessary! Finally, fine detail such as the edges of the skin, and the areas of root attachment, and any fine roots, can be added. I also painted the cord. For the most part, the detail was added using a dry-brush technique. I received a mark of 9.38 out of 10 for this piece. A bit of constructive criticism my tutor made: to emphasise the roots more, with some darker tones. I completely agree with that, in fact I actually think I should have used some artistic licence and added more roots, and made more of a feature out of them. I hope you enjoyed seeing the method for creating this painting! Assignment 8 is 'Botanical Illustration'.